Today's Nice Price or Crack Pipe contender was used in the owner's wedding, and is now being cast off due to its being a grim reminder of that event after his statistically unsurprising divorce. They apparently couldn't stick it out, but will this Mini's price make you want to say I do? Marriages frequently fail because of one party's erroneous thinking that they will change the egregious character flaws evident in their intended. In reality? Nah-gonna-happen. The owner of yesterday's BMW 545i however, made plenty of changes to his car, but is still trying to get the relationship annulled. That's likely to prove plenty difficult as an overwhelming 78% of you found both the car and its price to be unworthy of anything more than a shotgun wedding. You know, another potential reason for calling it quits on a marriage is lies and deceit. No really, it's true. Perhaps you've neglected to mention that other family you have in Omaha, or the fact that you once were a dude. Or maybe, you've lied about your age. That's the case with today's Webasto-equipped Original Mini which the seller proports to be a 1970, but which has all the appearance of a ‘91+ MKIV. Unlike the discovery that your virginal bride is in reality Joan Rivers, in this case that makes procurement of a marriage license for you and the car a snap, no matter what the state. There were so many different Mini special editions over the years that it's hard to pinpoint just what model this one is. The Webasto top, CD changer, and luxurious wooden dash point to it being a Mini 35 SE, which was the left-hand drive export edition of the England-only British Open Classic model. The car's two-tone paint features no model designation or other identifier, so I will leave it up to the eagle-eyed Mini experts in the crowd to ID the car with certainty. One thing that is certain is that residing under this Mini's hood is the SPI (Single Point Injection) - or throttlebody - edition of the long-serving 1,275-cc A-series. That engine in one form or another has motivated any number of fabulous British cars - everything from Morris Minors to MG Midgets and Austin Healey Sprites, a frogeye edition of which this seller seems also to possess. Parts for not only the A-series, but its sump-mounted gearbox (yes, they share the same lube) are easily accessible, even in the US. If you've never driven a Mini then you've missed one of automobiledom's most rewarding experiences. 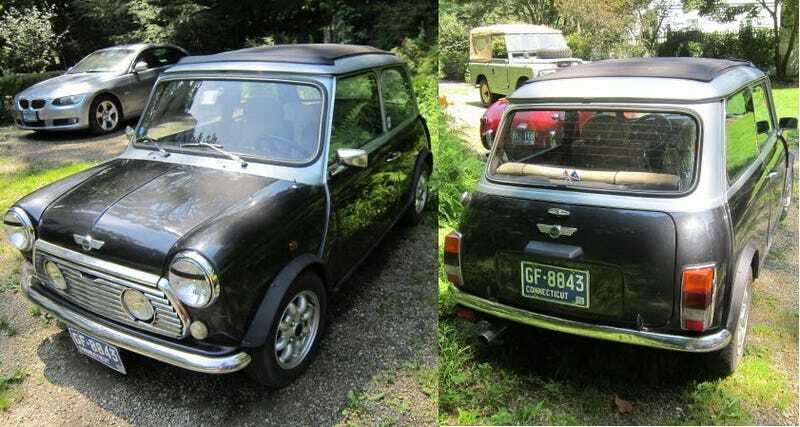 Alec Issigonis' masterpiece, whether rubber cone or hydrolastic suspended, are amazing to drive, and are about as close to rollerskating through traffic as a family of four can get without actually, well, you know, rollerskating through traffic. This one, with its upgraded interior, open roof and remarkably low (33,000) mileage, could be just the thing to start a new life with, as long as you're cool with the whole age difference. You'd also have to be cool with the seller's $16,500 asking price - no mythical divorce deal here - which it is now time to determine the value of. 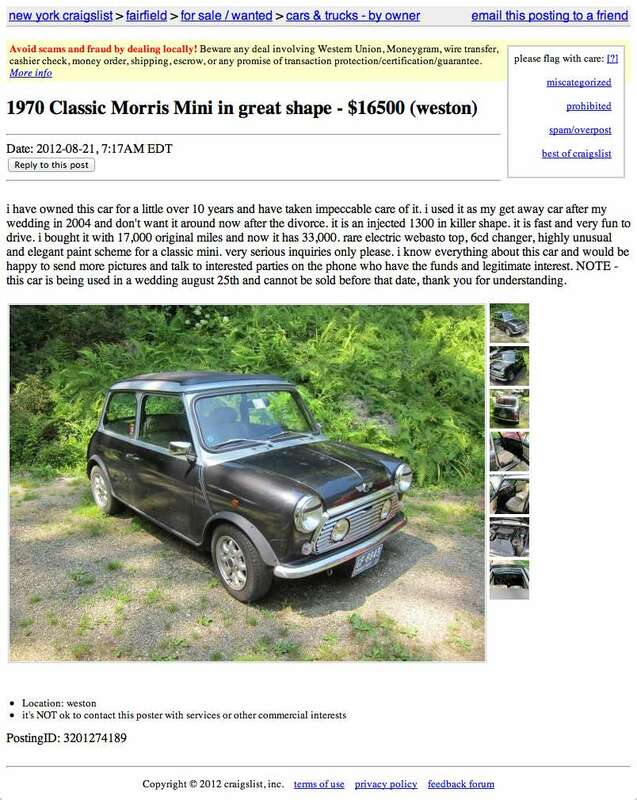 What do you think about that price for this Mini? Does that make you think the seller is unlucky at love but lucky at cars? Or, is that Mini proposal too maxi to accept? New York (Weston) Craigslist or go here if the ad disappears. H/T to HavenTech for the hookup!